Here you will find all the information, tricks, know-how, and advice to help you print your 3D model in our Multijet Fusion PA12 material. The Multijet Fusion PA12 objects printed through Sculpteo are created from a fine polyamide powder. The material is characterized by good elasticity and high impact resistance, unlike some of the other materials offered by Sculpteo. Moreover, polyamide has an excellent resistance to chemicals, especially hydrocarbons, aldehydes, ketones, mineral bases and salts, alcohols, fuels, detergents, oils and fats. HP plastic is great for both experienced professionals and beginning designers because of its high precision. The Multijet Fusion PA12 objects are well suited against scratches and abrasion. It is also light stabilized, U.V. stabilized and stable to weather. This 3D printing material is biocompatible. Coming out of the printer, Multijet Fusion PA12 parts are grey. This is the 'non-dyed' option, which is a more economical option for you to choose from compared to our other materials. Another option is our non dyed polished option which is also grey but has a smooth surface. Two other finishing options are available for our Multijet Fusion PA12 material: your parts can be dyed in black thanks to the Color Touch and Color Resist finishes. It is possible to paint your objects at home using material-specific techniques. To learn more, refer to our paragraph about finishes and colors for polyamide models. Here, you can see two versions of the same object: the left one is Non-dyed, the right one is finished with the Color Resist option. Your Multijet Fusion PA12 object is estimated to arrive in 5-7 business days. Particularly large objects can extend the processing time by 1-2 days on average. In addition, polishing can extend the processing time by 1 day. The estimated shipping time is also calculated automatically as the object is uploaded. Once you upload your 3D model to our website, it is received by a Sculpteo team member, who expertly places the model into the next available batch. To 3D print your Multijet Fusion PA12 object, we use the HP Multi Jet Fusion 3D 4200. The Multi Jet Fusion process is similar to binder jetting technology as it uses a liquid binding agent to create the layers of your object. In addition, a detailing agent is used to obtain fine details and to smooth the surface of the object. Layer by layer, the object is created from the combination of the powder, the liquid agents (fusing and detailing) and the energy (heating process). The HP process is faster than SLS technology but it still needs to cool. When the parts are 3D printed, the building box is placed into the post-processing station that cools the parts and prepares them for cleaning. The object is extracted from the powder which is sieved and partly recycled for another 3D printing batch. The object is then brushed, which removes a large portion of the polyamide powder, and vacuum-cleaned, which removes the fine polyamide powder that the brush may have missed. Our Multijet Fusion PA12 offers great flexibility when 3D printing, especially complex models, as it is flexible, offers high impact resistance, is light stabilized and is stable to every weather. As a result, the objects in this material have a wide range of uses from mechanical (prototypes, geared systems, articulated objects, etc. ), electrical, medical, ornamental, or even educational. In the automotive industry, it is mainly used for interior components for crash-relevant parts. Technical properties of the Multijet Fusion PA12 change depending on the thickness of your model. With a 0.6 mm wall thickness, your model will be flexible. With a 2 mm wall thickness, it will be rigid. Please check our blog post on elastic modulus measurements for more information on flexibility. With regards to water qualities, Multijet Fusion PA12 is water-resistant but not waterproof. Thus the 3D object must not rest in contact with water for extended periods of time. In terms of temperature, if the plastic is subjected to heat above 187°C (369°F), it is possible that the physical form of the object can significantly be altered. Due to the printing process, your objects will have upskin and downskin. Upskin is a little concave, whereas downskin will show slight convex. Upskin will appear on the top of your object, downskin at the bottom. This is important to consider when you set the orientation of your 3D model. If the upskin and downskin will affect your design, set the orientation beforehand and we will do our best to honor it, otherwise our technicians will choose the best one. Non-dyed: Grey surface with no finish, as it comes straight out of the 3D printer. Ideal for prototyping and mechanical tests. Non-dyed polished: Grey surface with a smooth finish ( tribo -finishing). Dyeing with Color Resist finish : A dyeing finish with a matte look that resists friction and allows for a more consistent color between different production batches. The available color for this finishing option is black. Dyeing with Color Touch finish : With this dyeing finishing your 3D printed part gets a satin look. It withstands daily handling and is the perfect finish for parts that are exposed to external conditions, scratching and rubbing. The available color for this finishing option is black. 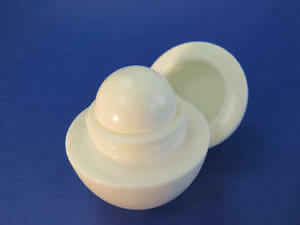 Your Multijet Fusion PA12 part is made from a reusable polyamide powder. The maximum size of your models are limited by the physical size of our 3D printers - nothing can be printed larger than the printer bed. 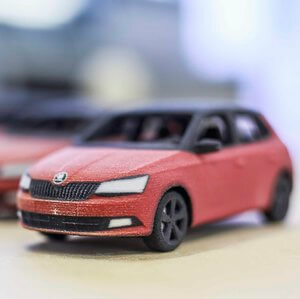 There is no minimum size for polyamide prints, keeping in mind minimum thickness for walls and structural aspects, to ensure the object will not break is 0.6 mm. The walls of your design must adhere to a minimum thickness of 0.6 mm in order to guarantee the structure will not break. If the walls of your model are less than 0.6 mm, you can to add a support structure to maintain stability. A stemmed element is a design aspect which is at least twice as long as it is thick. For unsupported and stemmed elements or parts of the design with a particular design constraint, it is also important to respect a minimum thickness of 0.9 mm in order to guarantee the object will not break. With a 0.6 wall thickness, your design will be slightly flexible. To obtain more rigidity, we advise you to choose a 2 mm wall thickness. Thin walls supporting large, heavy plastic models can warp under the weight of itself. Sculpteo offers an online solidity check tool which highlights parts of the print that may be too thin for a print. From there you are able to tweak your design in order to create an object that is an appropriate thickness. To use it, you just need to upload your 3D file , select your material and click on “Verification” tab. 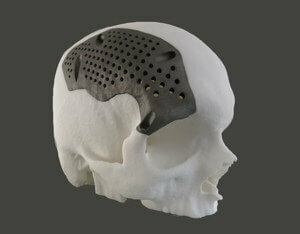 Our Multijet Fusion PA12 material has the ability to print the most complex designs of our materials. An example of a complex design is a volume enclosed within another volume, like a chain or maraca. Our 3D printers have the ability to 3D print a fully interlocked chain out of the printer, with no support structures to remove. For a successful 3D print a minimum clearance between objects is required to allow excess material to be blown out. If this space is not left within the design, the object will be a solid. This is particularly important for articulated objects - as the space left between the walls will define the object’s ability to move. 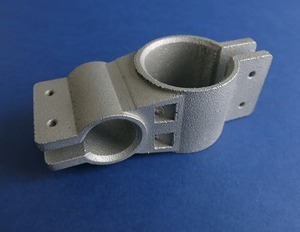 Objects printed in Multijet Fusion PA12 can be printed to be assembled. As long as a width of at least 0.5 mm is left between the different parts of the object. Using the tool requires adding two holes to your model, which will serve as the drain for the excess powder material within the object. The minimum size of these holes is determined by our website. Thickness of the hole will also be considered. Otherwise it is possible to hollow your object manually in your 3D modeling software.